Westmead Hospital clinical nurse specialist Anjla Devi with first outpatient Chee Sum Wong, director of nursing Kate Hackett and gastroenterology head Prof Jacob George. Westmead Hospital has celebrated the second milestone in the refurbishment of its gastroenterology ward, with the opening of the renovated outpatient facility. Epping resident Chee Sum Wong was the first outpatient to visit the revamped space, now known as the gastroenterology day centre. Mr Wong, 61, spent two hours in the clinic on October 12 and said it was very comfortable. “It’s a very nice space and the staff are so friendly and helpful,” he said. 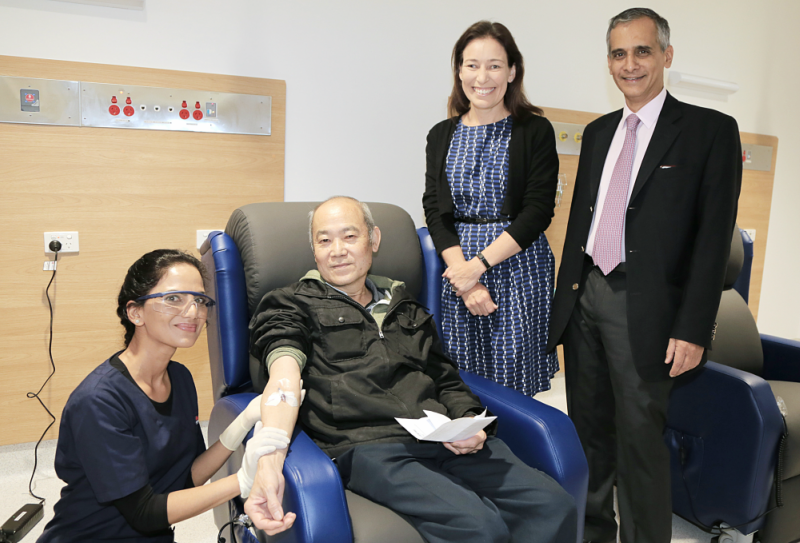 Mr Wong met with Westmead Hospital gastroenterology head Prof Jacob George, director of nursing Kate Hackett and clinical nurse specialist Anjla Devi, who were also on hand to celebrate the refurbished space. The new day centre is part of a complete refurbishment of the gastroenterology ward. The new-look 16-bed inpatient ward also opened this week, offering larger treatment rooms and a new negative pressure isolation room for immunocompromised and infectious patients. The space is the first clinical area to be refurbished in the 2017-2020 package of refurbishments, delivered under the Westmead Redevelopment. More than 30 per cent of clinical areas at the hospital will be refurbished through the project.